A pretty common burning strategy involves the use of both hardwood and softwood pellets throughout the heating season. Here’s a typical scenario: For those first autumn months, burn Cleanfire Hardwood, then switch to the hotter 100% softwood pellets, Cleanfire Pacific, for the cold winter months – then switch back to the Cleanfire Hardwood while the heating season winds down through late winter and early spring. Not only are there significant heat output differences between hardwood and softwood wood pellets – but the ash content is much different as well. Hardwood pellets tend to produce more ash than softwood pellets – which makes for more cleaning and upkeep. Therefore, this burning strategy is also a perfect opportunity to learn which kind of pellets are the best fit for your home heating needs, your budget, and the amount of ash cleanup you’re willing to deal with. 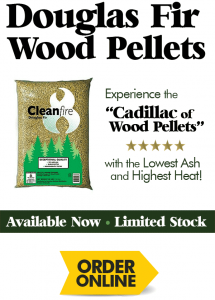 Lately, buzz about the extremely hot heat output you get from 100% Douglas Fir pellets has been spreading – so many folks have been incorporating our super-hot, low-ash Cleanfire Douglas Fir Wood Pellets into their burning strategy. Many Woodpellets.com customers save this “Cadillac of Wood Pellets” for the bitter cold months, and burn their other pellets during the rest of the season. If you’d like to try mixing it up, you can always call us, or you can add multiple brands to your cart online 24/7 at Woodpellets.com. If you’d like to learn more, or would like some assistance with your order, call the experts at 1-800-PELLETS (800-735-5387) today! *Product availability varies by region.